Mukesh Ambani-owned Reliance Jio has rolled Rs 594 and Rs 297, two new long validity prepaid plans for JioPhone users. 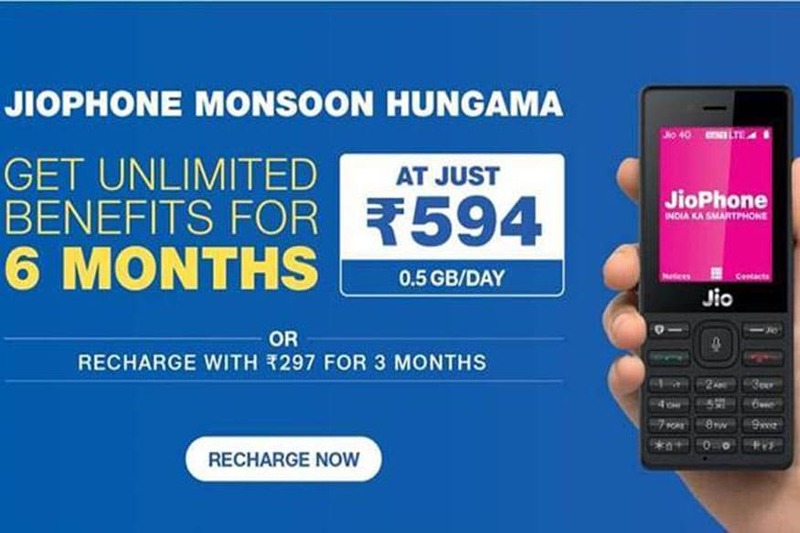 Under the Rs 594 plan, JioPhone users get unlimited daily data and complimentary access to Jio applications for 168 days (roughly six months). The unlimited high speed data, however, is limited to 0.5GB thereafter the speed is reduced to 64Kbps. The plan also includes 300 SMSes for 28 days. On the other hand, under the Rs 297 plans, the users will get the same unlimited local and national calling without any daily FUP limit. The users will get 300 SMS per month and 0.5GB data per day. If the user crosses the daily limit then the speed will come down to 64Kbps. The plan comes with the validity of 84 days which means a total of 3 months. Additionally, Bharti Airtel has introduced two new long validity plans for its prepaid customers. Earlier the telecom operator launched Rs 1,699 yearly prepaid plan which is now an open market plan across all the circles. The new long validity plans priced at Rs 998 and Rs 597 come with a validity of 336 days and 168 days respectively. In comparison to the Rs 1,699 plan introduced early this year, which is aimed at data-heavy users, these two long validity plans seem to target those with heavy voice calling use.